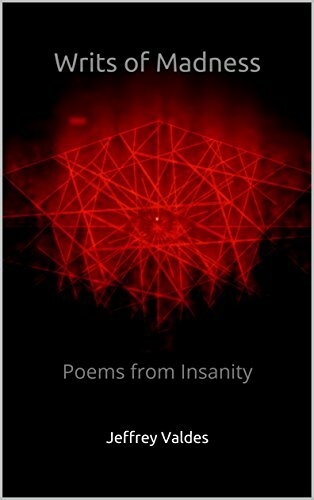 “Writs of Madness: Poems from Insanity” is a collection of poems I wrote over the ten years I have suffered so far with bipolar paranoid schizophrenia. The collection is organized beginning with the most recently written poems done in a more lucid state of mind and gradually progress to writings that more accurately reflect a psychotic, hallucinating mind. The poems are left as raw and unedited as possible, so as to provide a quality image of the inner workings of a mentally ill mind-frame. Some of the poems, at times, can be rather graphic and somewhat disturbing. As the reader progresses through the book, they will notice a change in writing style several times, as some poems reflect dreams, hallucinations, and the impact of psychosis. The writings get more and more unstable as the book progresses, but continue to provide an entertaining, insightful view of the soul and mind of the author. This collection chronicles that past ten years of the author’s life, who has always wanted to be an artist to some degree. The notion of creating something from nothing is very appealing and has driven the impulse to write down the stylized dreams that occur with immense frequency every night. During several periods of reading this poetry, the reader will encounter how the author coped with hallucinations, depression, mania, self-harm, and other toxic behavior. There are no notes or commentary in this book save for the introduction. The author wished that the poems spoke for themselves, and he invites the reader to attempt to distinguish between lucid periods and truly psychotic moments. This is the second book published by this author; the first being a memoir of the author’s experience with mental illness. This first book includes the detailed story of the author’s experiences and also contains more in-depth short stories that sprang out of the author’s illness. It can be found on the author’s page.